The Family Bond puts the fun in functional family. Offering quiet suggestions and thought-provoking stories in two-page vignettes, this little book is perfect reading during bus rides or lunch hours. 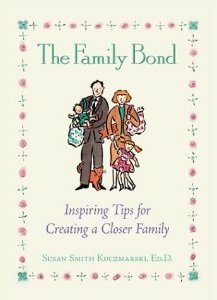 Dr. Susan Smith Kuczmarksi’s entertaining voice conjures up pictures of warm and enjoyable family life that seem easily achievable for everyone willing to practice patience and admit that parents learn as much from kids as kids do from their parents. Each very short chapter focuses on a particular concept–always one that is gentle, positive, and generally humorous–and ends with a one-sentence summary. From “Parenting means sharing and appreciating the extraordinary magic of ordinary daily events” to “Let go and PLAY,” these ideas emphasize the importance of open communication, laughter, and shared family experiences of all kinds. Her suggestion of an annual art project that everyone creates together is sure to result in some true family treasures, and her comparison of teenagers to toads (in a positive light) will have parents of teens giggling and rediscovering the joys that the teen years can bring to families. More serious family activities cover basics like division of everyday chores, along with great ideas on how to develop a code of family values that all members take an active role in creating. What the author has learned from her family is present on every page, and her personal experiences combined with her professional skills result in a book that’s easily accessible and valuable for families everywhere. “Filled with positive, understanding messages about family life and the importance of recognizing each child's individuality. It's easy to read and provides ideas and tips on ways to encourage family togetherness." --- Bernice Weissbourd, President, Family Focus, Inc.
“Could there be an antidote to the hectic, haphazard parenting that characterizes so many families today? In contrast to the great attention being paid to dysfunctional families, the author offers a fun formula for functional 'family-making.’"